A big Foot hot spot in California has unearthed a pretty weird video, showing a possible Big Foot carrying something in it's arms? Even if it is a fake, I'd freak out if I saw that peaking into my window. I would shoot first and ask questions later. Video...Caught On Film...Bigfoot Sighting In Provo Canyon!!! This Bigfoot sighting is from 1913! Wow! It's not the Loch Ness monster, but a Yellowknife angler has ignited debate of his own after landing, and then releasing, a fluorescent green pike while fishing in Great Slave Lake. 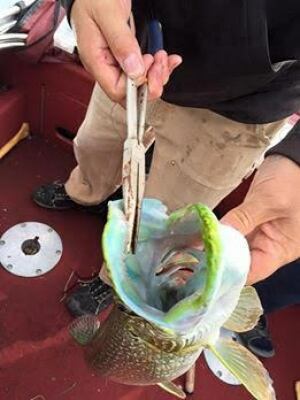 "The whole top of the fish had a different green," said Randy Straker. "If you look at the mouth, it looked like green lipstick. It was so bright." Straker was fishing with his friend Craig Thomas on Sunday in the lake's North Arm when he made the catch. 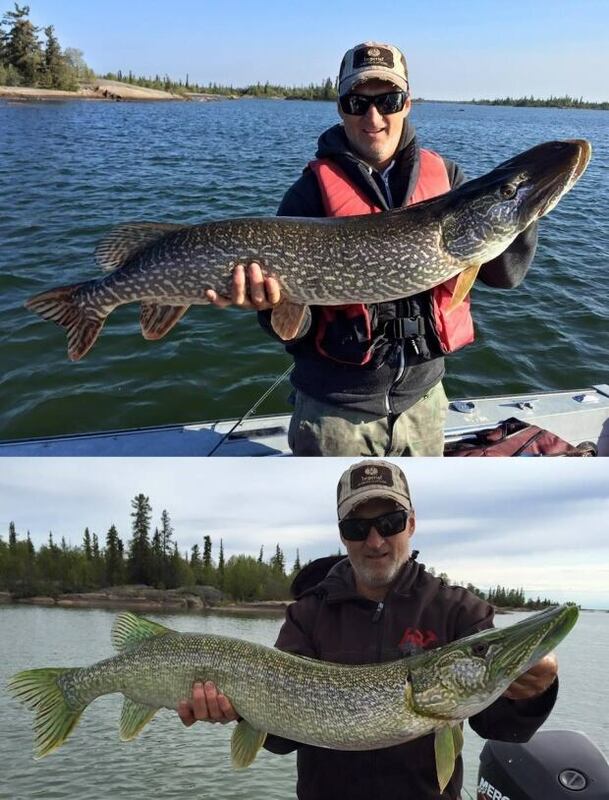 After pulling the pike into the boat — Straker estimated it at 38 to 40 inches and 12 to 14 pounds — the two men snapped a few photos and released their catch. Afterward, though, they realized that they'd caught something quite unique. "In hindsight, after looking at the pictures, we should have taken a whole lot more," he said. "But we compared some pictures that we'd taken previously of a fish. And when you put it up against another pike, it's way lighter. The fins were kind of a translucent green as opposed to the darker colours of a regular pike. Avid fishermen, Thomas and Straker had worked their way around the lake for the past five years, and had "just started ... exploring in that area," said Straker. The two were finishing up their day when Straker landed the fish. Pike, also known as jackfish, are common in Great Slave Lake, but when the catch passed by the boat, both men realized something was different. "I was wearing polarized lenses, and I thought maybe that was causing some different coloration in the fish," he said. "I was just about to pull my glasses off to take another look... and then my buddy made a comment about how strange the fish looked. Jessica passed her Level Two Business Studies diploma thingy last week, and buoyed up by this success has continued to carve a bloody swathe through the chaos that was once my office. She is now setting up a new and improved filing system. Why didn't I employ her ten years ago? "Because I was only seven then, silly" she replies. Once again youth triumphs over staid middle age. Brand X, Phil Collins, Roger Dean, Percy Jones, Rick Wakeman, Luca Ferarri, Cream, Mike Taylor, Genesis, Musical Box, Roy Weard, Dogwatch, That Legendary Wooden Lion, Hawkwind, Jon Anderson, and Yes fans had better look out! The latest issue of Gonzo Weekly (#144) is available to read at www.gonzoweekly.com, and to download at http://www.gonzoweekly.com/pdf/. It has Percy Jones from Brand X on the front cover together with an interview with him in which, amongst other things, he reveals how Phil Collins was planning to leave Genesis many years before he actually did, We also have an exclusive interview with Roger Dean about Wakemanfest and peculiar fishes, and an exclusive interview with Italian author Luca Ferrari about the enigmatoic Mike Taylor who is best known for having written several songs for Cream. Jon muses about reviews Gabriella Coleman on Anonymous. Doug interviews The Musical Box, and -I almost forgot - there is a personal message from Rick Wakeman. Thom waxes all poetical like, whilst the legendary Roy Weard continues his regular column. And there is a radio show from M Destiny at Friday Night Progressive, and the return of Strange Fruit with a football themed show. There is also a collection of more news, reviews, views, interviews and water opossums with something to lose (OK, nothing to do with small marsupials planning to pray to St Anthony of Padyua for an intercession, but I got carried away with things that rhymed with OOOOS) than you can shake a stick at. And the best part is IT's ABSOLUTELY FREE!!! ON THIS DAY IN 1660 - The books of John Milton were burned in London due to his attacks on King Charles II.